Sylvia Bodmer was born in Duisburg, Germany in 1902. During her 50-year career, she gained a reputation as one of the foremost proponents of the inclusive and free-interpretive dance style of Rudolf Laban. Bodmer showed an aptitude for mathematics as a child, but her gender proved an obstacle to employment in that field, despite a good qualification. She gravitated toward dance, and came to know about Rudolf Laban’s work through Suzanne Perrottet, one of his earliest followers. After 18 months with Perrottet, she went to study with Laban’s school in Stuttgart. Laban, impressed with her dancing, in 1922 asked her to join his performing dance group Tanzbuhne Laban, with whom she spent two years. Here is an exert from her memoirs referring to her time spent with Laban in Gleschendorf. 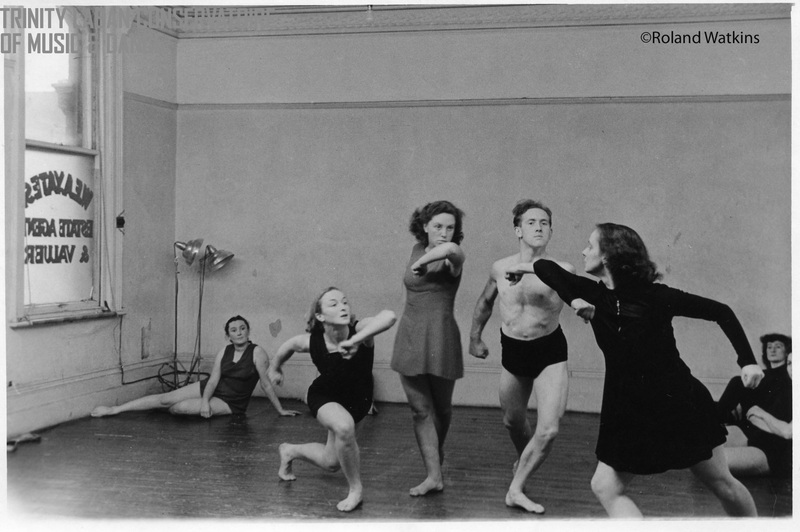 In 1924 Bodmer joined with Lotte Mueller in Frankfurt to form a school based on Laban’s ideas, and then joined with Edgar Frank in 1927 to form a chamber dance group. Sylvia brought her young family to Manchester, England, in 1938. She began teaching dance, and founded the Young Dancers’ Group. Laban and Lisa Ullmann also found themselves through different circumstances in Manchester. 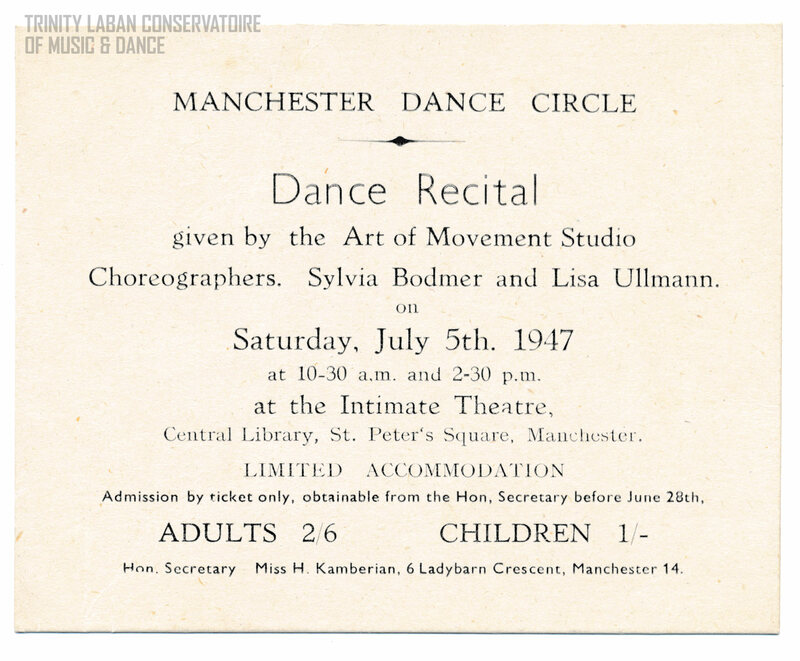 It is here that Bodmer and Ullmann set up the Manchester Dance Circle in 1943. It created a platform for Ullmann’s training classes, Bodmer’s movement choir works, and Laban’s lectures. Laban and Lisa Ullmann left Manchester in 1953 (Bodmer, W.2004 p.6), taking the Art of Movement Studio down to Addlestone, Surrey. Sylvia continued to run the Manchester Dance Circle. Central to Laban’s teaching were his concepts of body movement, ‘space harmony’ and dynamics. This enabled him to work out ways of systematizing the study of human movement, and so led him to the development of movement notation. 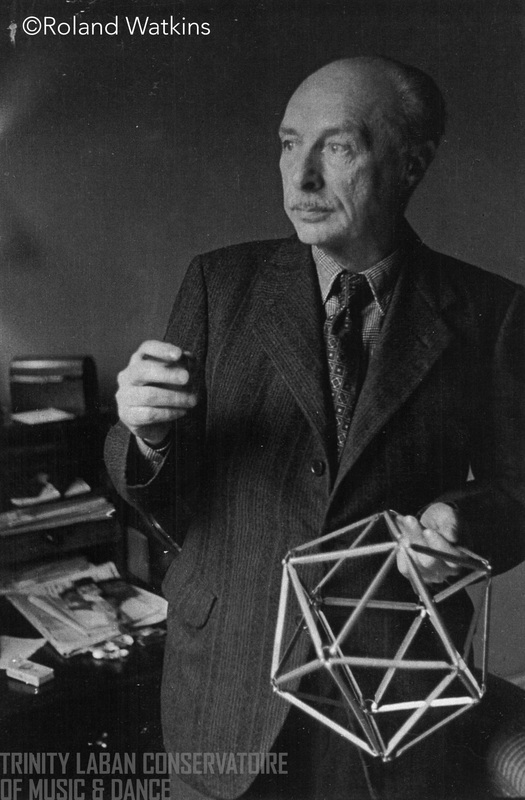 He was unique in his development of the idea of ‘efforts’, the idea of scales related to points in space defining an icosahedron around the human body and in his applications to practical questions in time and motion study and the assessment of personality. Sylvia’s earlier mathematics training allowed her to quickly define Laban’s direction and to develop her own ‘space forms’. Bodmer became known as one of the finest interpreters of Laban’s work, both as a solo dancer and a teacher. She continued to teach and develop his work for the rest of her life until she died in 1989. What was Rudolf Laban like? In 1938 Rudolf Laban arrived penniless and destitute in the UK, a refugee from Nazi Germany. 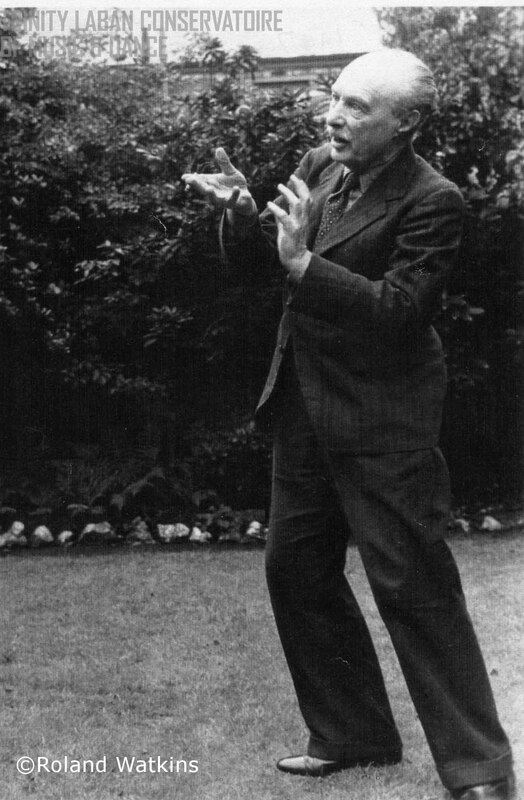 By the time of his death in 1958 his school, the Laban Art of Movement Centre in Addlestone, Surrey was flourishing, his ideas on movement in education were becoming widespread in schools and colleges across the UK, and his ideas on movement in drama were being taught at theatre schools. But who was he and why did he come to the UK? And what had he done in his life before he arrived in Dover at the age of 59? Valerie Preston-Dunlop first met Rudolf Laban when she was 16 and a new student at the Art of Movement Studio in 1947. Rudolf Laban was 68 by then and a somewhat reclusive figure who spoke English with ‘a very dark voice and strong German accent’ (Quote from Petit, June (2012) at 30min 7secs]. It wasn’t until many years later after Valerie had travelled extensively throughout Europe meeting people who had known and worked with Rudolf Laban, that she discovered just how prestigious a career he had had in Germany before falling foul of the Nazi regime and fleeing to Paris and the UK. Much has now been written about Rudolf Laban’s life and career, not least the book Rudolf Laban: An extraordinary life by Valerie Preston-Dunlop (1998) London, England: Dance Books. A brief summary can be found on the Trinity Laban website. But we wanted to find out what he was like as an educator and as a human being. So we interrogated the Laban Archive to find out. She refers to Laban having ‘women all around’. During the course of his life he married twice and fathered nine children by five different women and had many mistresses. 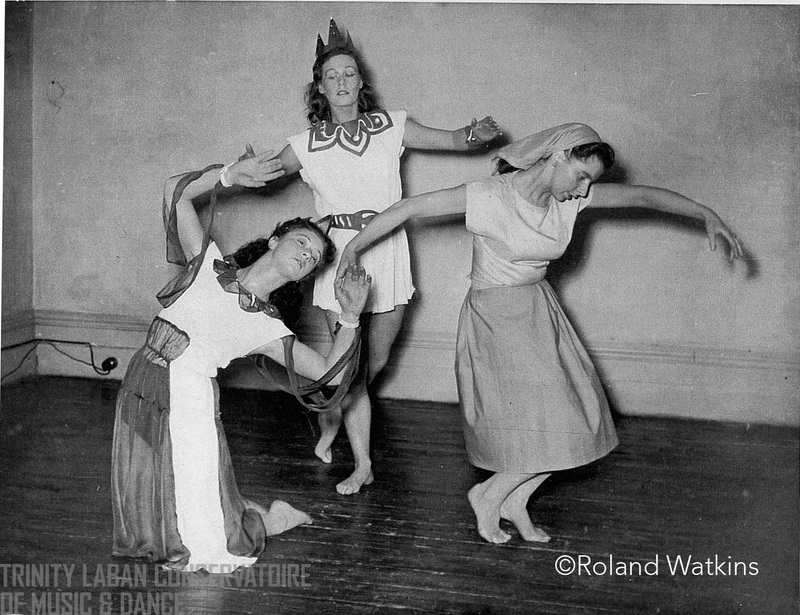 Having managed to get out of Germany and eventually arriving in the UK in 1938, Laban joined up with Lisa Ullmann, Sylvia Bodmer and others and ran modern dance holiday courses up and down the country. Margaret McCallum, a dance teacher in schools in the UK at the time, took part in modern dance holiday courses at Bedford College of Physical Education in 1942 and at St. Margaret’s School in Bushey, taught by Rudolf Laban and Lisa Ullmann. McCallum mentions Rudolf Laban’s work with factory girls and finding economical ways for them to work. Britain in the early 1940s was ‘in the throes of an all-out war effort’ (Preston-Dunlop, p. 218). Laban teamed up with Frederick Lawrence, a management consultant concerned with work efficiency in industry, and together they tackled the problem of enabling women to undertake the heavy lifting and industrial jobs previously done by men. Laban introduced the use of momentum, so that through swinging movements of the whole body, women could achieve what men had done using leverage of their arms. He also applied the concepts of movement harmony so that a job requiring a downward pressure for example would have an upward movement to release that pressure incorporated into the movement phrase (Preston-Dunlop, p.223). North went on to become the Principal of the Art of Movement Studio, renamed the Laban Centre for Movement and Dance, in 1973. 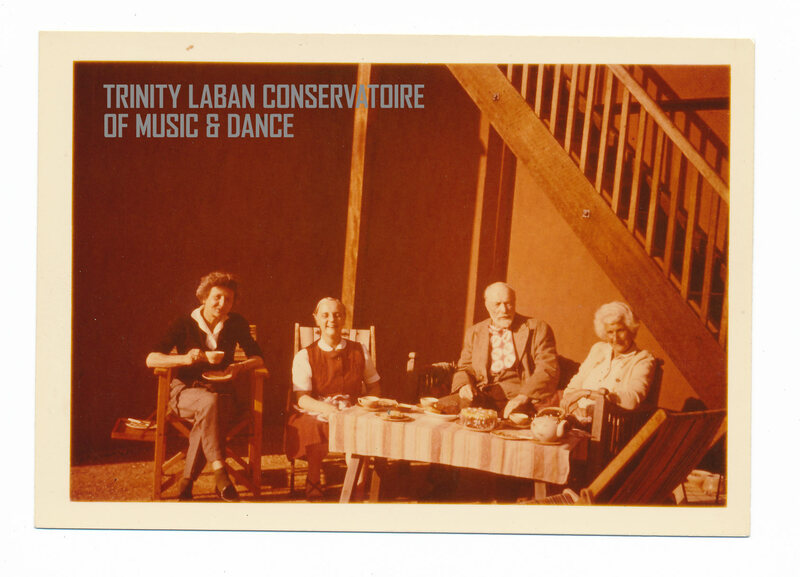 We shall hear more of her story in later blog posts as we continue our history of what is now the Faculty of Dance at Trinity Laban, in this our 70th year. Next month we focus on the life and career of another of the big names in our history, that of Sylvia Bodmer. Bodmer, Sylvia (1980s) [Recording of interview with Sylvia Bodmer]. Sylvia Bodmer Collection (D1/H/3/2). Laban Archive, Library and Archive, Faculty of Dance, Trinity Laban Conservatoire of Music and Dance, London, England. Bodmer, Sylvia (1985) [Interviews with Sylvia Bodmer]. Laban Collection (LC/E/1/3/A/1). Laban Archive, Library and Archive, Faculty of Dance, Trinity Laban Conservatoire of Music and Dance, London, England. Laban, Rudolf and North, Marion (1956) [Laban 1956. Original letters between Marion North and Rudolf Laban during this year; transcripts and originals]. Marion North Collection (D4/2012/15/11/10/2). Laban Archive, Library and Archive, Faculty of Dance, Trinity Laban Conservatoire of Music and Dance, London, England. McCallum, Margaret (2004) [Interview with Margaret McCallum and Christine Edwards]. Laban Collection (LC/E/1/20). Laban Archive, Library and Archive, Faculty of Dance, Trinity Laban Conservatoire of Music and Dance, London, England. Petit, June (2012) [Recording of interview between Jane Fowler and June Petit (nee Preston), concerning June’s experiences as a student at the Art of Movement Studio, Addlestone between 1958-1959]. Laban Collection (LC/E/1/26). Laban Archive, Library and Archive, Faculty of Dance, Trinity Laban Conservatoire of Music and Dance, London, England. Preston-Dunlop, V. (1998). Rudolf Laban: An extraordinary life. London, England: Dance Books Ltd.
Walton, Joy (2004) [Interview with Joy Walton, a former pupil of Rudolf Laban’s]. Laban Collection (LC/E/1/19). Laban Archive, Library and Archive, Faculty of Dance, Trinity Laban Conservatoire of Music and Dance, London, England. The Art of Movement Studio (now the Faculty of Dance, Trinity Laban) first opened its doors to the public in January 1946 at 183-5 Oxford Road, Manchester. It was housed in rooms over a garage in a not particularly salubrious neighbourhood but it did have ‘a large room with windows all down one side and a reasonably well boarded floor’ (Thornton, p. 4). The Studio was the result of a lot of hard work on the part of Lisa Ullmann and Rudolf Laban who, since arriving in Manchester in 1942, had been training students in the cellar of a large house in Palatine House, Didsbury, Manchester (Preston-Dunlop, p. 222). 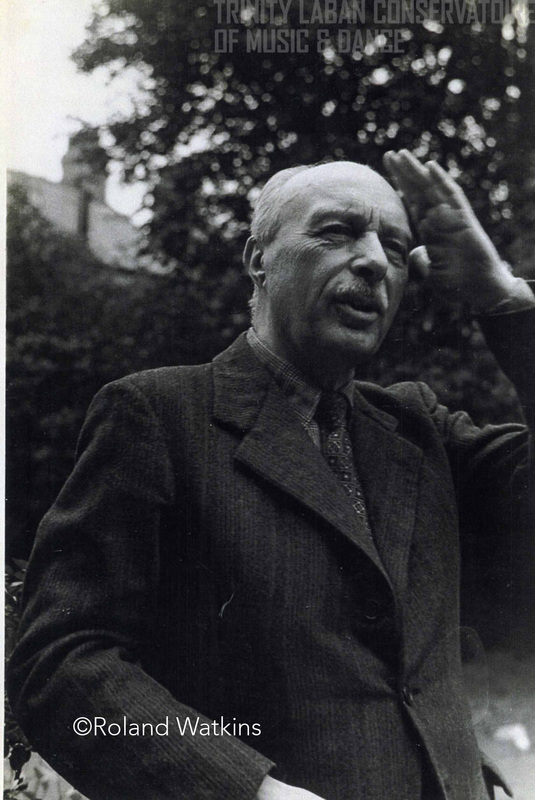 They had also been travelling the length and breadth of the UK conducting short courses and holiday courses and running a teachers’ training course for the past few years since Laban’s arrival in the UK in 1938. Lisa Ullmann had trained at a Laban School in Germany and been on the teaching staff at Kurt Jooss’s Folkwangschule Essen (now the Folkwang University of the Arts). She came to England with Ballets Jooss in 1934 to teach at the Jooss-Leeder school at Dartington Hall. During this time, she set up and ran a movement choir and conducted evening classes for the Worker’s Educational Association in Plymouth and for teachers at the University of Exeter. She came across Rudolf Laban whilst passing through Paris in 1937 (Preston-Dunlop, p. 206). He had managed to escape Germany having fallen foul of the Nazi regime, but was now penniless and destitute. On her return to Dartington she must have discussed his plight with Kurt Jooss who then issued a personal invitation to Laban to come and stay at Dartington Hall, which he did in 1938. By 1945, the demand for dance training was such that Lisa Ullmann and Rudolf Laban decided to set up a centre and took on a five-year lease of the Oxford Road premises. 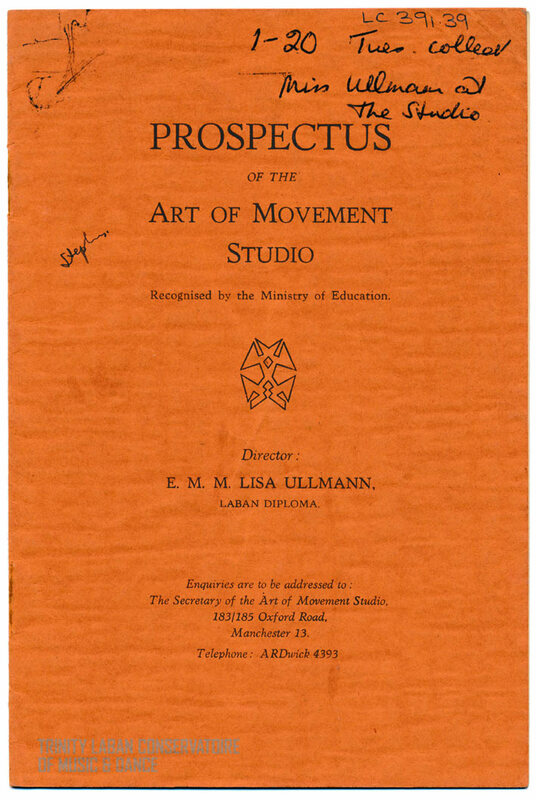 They had wanted to call the centre the ‘Basic Movement Studio’ to emphasise their view of movement as ‘a common denominator to life’ (Willson, p.32) but this title had already been taken so they settled instead for ‘The Art of Movement Studio’. Classes focused on ‘theoretical tuition and practical exercise based on the sudy of harmony and rhythm in movement’ (Quoted from the Studio prospectus below). Dr Valerie Preston-Dunlop became a student at the Art of Movement Studio in 1947. Here she talks about some of the things that Rudolf Laban expected from her during the course of her studies there. Displays of dance were given at the Studio regularly, and as their work became more well known, students from the Studio were invited to perform at local halls and theatres. Sylvia Bodmer was one of the first tutors at the Studio. She had come to the UK in 1938 to escape the Nazi regime. Prior to this she had trained as a dancer at the Laban School in Stuttgart, Germany and performed with Rudolf Laban’s dance group at Gleschendorf in the 1920s. She had gone on to found a successful school in Frankfurt which provided choreography for the Frankfurt Opera House. On her arrival in the UK she began giving private movement lessons and by 1943 had set up the Manchester Dance Circle, a community dance group, to promulgate Rudolf Laban’s ideas. Whilst at the Art of Movement Studio, she founded the Young Dancers’ Group using the Studio’s advanced students. They performed at the Manchester Library Theatre and elsewhere in the local area to much acclaim. 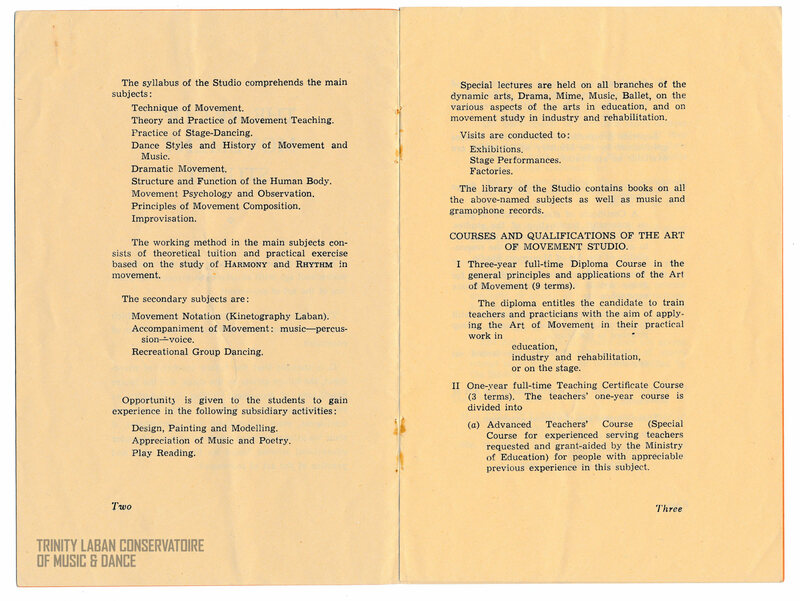 By 1950 the Art of Movement Studio was offering a selection of full and part-time courses and its student numbers had increased so much that it needed to find additional premises to rent nearby. Links were also being developed with the Unnamed Drama Society, with Joan Littlewood and her Theatre Workshop and with the Northern Theatre School. As these activities widened it became obvious that the Studio needed to find a much larger and better equipped centre. Through the generosity of the wealthy, philanthropic Elmhirst family, an estate of sixteen acres at Addlestone, near Weybridge, Surrey was donated and in October 1954, the Laban Art of Movement Centre was established. Our series continues next month with a closer look at Rudolf Laban – who was he and what was he like? Willson, F.M.G. (1997). In Just Order Move: The progress of the Laban Centre for Movement and Dance 1946-1996. London, England: The Athlone Press.